Proof Sets make for great gifts as each coin produced for that year is included in the set. Proof Sets are highly polished versions of the coins the U.S. Mint issues. 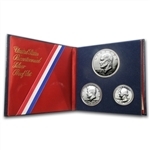 They have a frosty, mirror like finish and complete in a attractive display case, along with the U.S. Mint issued outer box and certificate of authenticity. The 1994 Proof set includes the Lincoln Cent, Jefferson Nickel, Roosevelt Dime and Washington Quarter and Kennedy Half Dollar coins in gem proof condition. The 1995 Proof set includes the Lincoln Cent, Jefferson Nickel, Roosevelt Dime and Washington Quarter and Kennedy Half Dollar coins in gem proof condition. The 1996 Proof set includes the Lincoln Cent, Jefferson Nickel, Roosevelt Dime and Washington Quarter and Kennedy Half Dollar coins in gem proof condition. The 1997 Proof set includes the Lincoln Cent, Jefferson Nickel, Roosevelt Dime and Washington Quarter and Kennedy Half Dollar coins in gem proof condition. The 1998 Proof set includes the Lincoln Cent, Jefferson Nickel, Roosevelt Dime and Washington Quarter and Kennedy Half Dollar coins in gem proof condition. The complete collection of all circulating coins released in proof condition from 1999 to 2008. One of our most popular sellers and an outstanding value. The first release in the popular Statehood Quarter Program. Includes the Delaware, Pennsylvania, New Jersey, Georgia and Connecticut coins in gem proof condition. The 1999 Proof set includes the Delaware, Pennsylvania, New Jersey, Georgia and Connecticut quarters plus the cent, nickel, dime and half dollar coins in gem proof condition. The 2nd year release in the Statehood Quarter Program. Includes the Massachusetts, Maryland, South Carolina, New Hampshire and Virginia coins in gem proof condition. The 2000 Proof Set includes the Massachusetts, Maryland, South Carolina, New Hampshire & Virginia quarters plus the cent, nickel, dime, half & dollar coins in gem proof condition. The 3rd year release in the Statehood Quarter Program. Includes the New York, North Carolina, Rhode Island, Vermont and Kentucky coins in gem proof condition. The 2001 Proof Set includes the New York, North Carolina, Rhode Island, Vermont & Kentucky quarters plus the cent, nickel, dime, half & dollar coins in gem proof condition. The 2002 Proof Set includes the Tennessee, Louisiana, Ohio, Indiana & Mississippi quarters plus the cent, nickel, dime, half & dollar coins in gem proof condition. The 5th year release in the Statehood Quarter Program. Includes the Illinois, Alabama, Maine, Missouri and Arkansas coins in gem proof condition. The 2002 Proof Set includes the Illinois, Alabama, Maine, Missouri and Arkansas quarters plus the cent, nickel, dime, half & dollar coins in gem proof condition. The 2004 Proof Set includes the Michigan, Florida, Texas, Iowa & Wisconsin quarters plus the cent, nickels, dime, half & dollar coins in gem proof condition. The 2005 Proof Set includes the California, Minnesota, Oregon, Kansas & West Virginia quarters plus the cent, nickels, dime, half & dollar coins in gem proof condition. The 8th year release in the Statehood Quarter Program. Includes the Nevada, Nebraska, Colorado, North and South Dakota coins in gem proof condition. The 2006 Proof Set includes the Nevada, Nebraska, Colorado, North & South Dakota quarters plus the cent, nickel, dime, half & dollar coins in gem proof condition. The 9th year release in the Statehood Quarter Program. Includes the Montana, Washington, Idaho, Wyoming & Utah coins in gem proof condition. The 2007 Proof Set includes the Montana, Washington, Idaho, Wyoming & Utah quarters plus the cent, nickel, dime, half & dollar coins in gem proof condition. The key release in the Statehood Quarter Program. Includes the Oklahoma, New Mexico, Arizona, Alaska and Hawaii coins in gem proof condition. The 2008 Proof Set includes the Oklahoma, New Mexico, Arizona, Alaska & Hawaii quarters plus the cent, nickel, dime, half & dollar coins in gem proof condition. The 2009 Proof Set includes the Territory Quarters, The Lincoln Bi-Centennial cents, the Presidential Dollars & the nickel, dime, half & sacagawea dollar in gem proof condition. The 2010 America the Beautiful Proof Set contains the Hot Springs, Yellowstone, Yosemite, Grand Canyon and Mt. Hood gem proof coins. The 2010 Silver Proof Set is a steal at these prices! These sets come complete with the box and certificate of authenticity as well as no toning on any coins and no writing on the box. The 2010 Proof Set includes the America the Beautiful Quarters, the Presidential Dollars & the cent, nickel, dime, half & sacagawea dollar in gem proof condition. The 2011 America the Beautiful Proof Set contains the Gettysburg, Glacier, Olympic, Vicksburg and Chickasaw gem proof coins. The 2011 Proof Set includes the America the Beautiful Quarters, the Presidential Dollars & the cent, nickel, dime, half & sacagawea dollar in gem proof condition. The 2012 America the Beautiful Proof Set contains the El Yunque, Chaco Canyon, Acadia, Hawaii Volcanoes and Denali gem proof coins. The RARE 2012 Proof Set includes the America the Beautiful Quarters, the Presidential Dollars & the cent, nickel, dime, half & sacagawea dollar in gem proof condition. The 2013 America the Beautiful Proof Set contains the White Mountain, Perry's Victory, Great Basin, McHenry and Mt. Rushmore gem proof coins. The 2013 Proof Set includes the America the Beautiful Quarters, the Presidential Dollars & the cent, nickel, dime, half & sacagawea dollar in gem proof condition. The 2014 America the Beautiful Proof Set contains the Smoky Mountains, Shenandoah, Arches, Great Sand Dunes and Everglades gem proof coins. The 2014 Proof Set includes the America the Beautiful Quarters, the Presidential Dollars & the cent, nickel, dime, half & sacagawea dollar in gem proof condition. Mintage 714,661. The 2015 Proof Set includes the America the Beautiful Quarters, the Presidential Dollars & the cent, nickel, dime, half & Sacagawea dollar in gem proof condition. These 2016 America the Beautiful sets feature the Shawnee, Cumberland Gap, Harpers Ferry, Roosevelt and Fort Moultrie Park Quarters. The 2016 Proof Set includes the America the Beautiful Quarters, the Presidential Dollars & the cent, nickel, dime, half & Sacagawea dollar in gem proof condition. These 2017 America the Beautiful sets feature the Effigy, Douglass, Ozark, Ellis Island and George Rogers Clark Park Quarters. The 2017 Proof Set includes the America the Beautiful Quarters plus the cent, nickel, dime, half & Sacagawea dollar in gem proof condition. These 2018 America the Beautiful sets feature the Pictured Rocks, Apostle Islands, Voyageurs, Cumberland Island and Block Island Park Quarters. The 2018 Proof Set includes the America the Beautiful Quarters plus the cent, nickel, dime, half & Sacagawea dollar in gem proof condition. The 2019 Proof Set includes the America the Beautiful Quarters plus the cent, nickel, dime, half & Sacagawea dollar in gem proof condition. Plus the bonus 2019-W Cent.